Directions: Fushimi Inari Shrine is easy to access by train. Just take the JR Nara Line from Kyoto Station two stops to Inari. The main gate is just across the street. 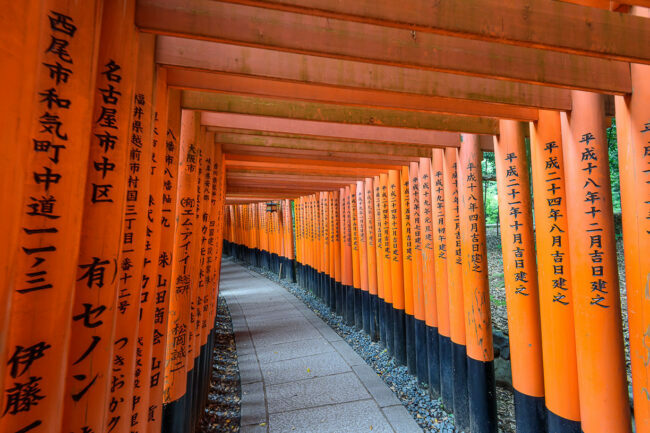 Fushimi Inari is a mountainside Shinto shrine in Kyoto, Japan. It’s one of the oldest shrines in Kyoto and is famous for its trails of seemingly endless torii gates. The shrine’s main building sits at the base of the mountain just inside the entrance, but behind the main grounds are hiking trails that lead up the mountain covered in thousands of torii gates. The gates are dense, and quite impressive, at the trailhead but grow farther between the higher up the mountain you go. Along the way are various smaller shrines and at the half-way point, a few restaurants. Back towards the base just past the parallel rows of dense torii gates I found a separate trail up the reverse side of the mountain through a bamboo forest. I believe this trail is longer and more difficult (and with less direction), but the beautiful bamboo forest was worth it. Once at the top, you can come back down the regular path and not miss any torii gates. The shrine is open 24 hours a day so the best photographic opportunities are at sunrise and sunset, when the crowds are much less dense. Mid-day is full of tourists, but you can still get a photo of the torii gates with no people in frame if you’re patient enough. Bring a tripod if you can but only if you’re planning on being there at night, dusk, or dawn. A tripod would just get in the way during the day with large crowds. A wide-angle lens like a 16-35mm is useful when walking through the gates, but a normal zoom (24-70mm or 24-120mm) could work just as well, or better, depending on your photographic style. I changed lenses and used both during the hike. 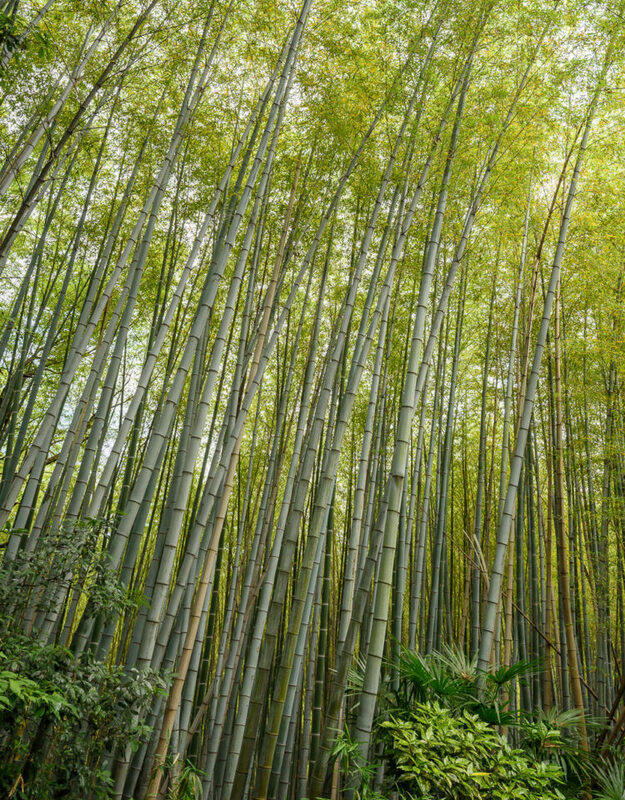 You can buy water at various places along the trail, but not if you decide to hike up the bamboo forest side! Even on a day with a lot of sun it can get dark under the forest and torii gates. I recommend a lens with vibration reduction and watch that your shutter speed doesn’t get too low. Increase ISO to maintain a sharp image. 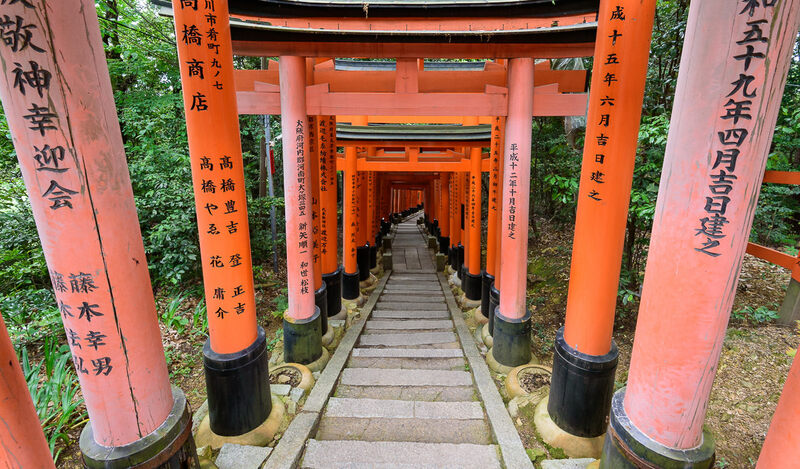 A small aperture like f/11-f/16 will ensure your images of the tunnels of torii gates will have maximum depth. Using a wide-angle lens will also help to maximize depth. Use the curves in the trails to help hide other visitors and keep them out of your images!